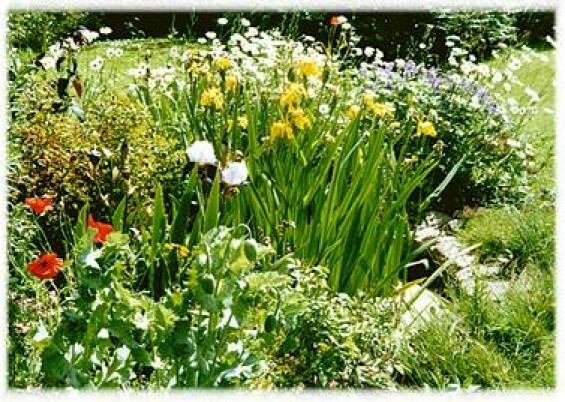 Can you afford to maintain your garden? What to look for in a garden that suits you. I have been thinking about my garden’s pros and cons and whether it suits me given my current limitations, having been ill and then not been fit for 15 years. It’s a high-maintenance flowerful wildlife-friendly country garden. What made me think more than usual about it was the upcoming cost of putting in a new fence, now that my hedge has been decimated (I wanted more of a view and needed to thin them anyway) and the lovely old oak picket fence has capsized and collapsed, needing a new stock fence to keep the deer out. I’ve had a quote for £750.. so I am pausing for breath (and another quote) before taking the plunge, given the investment. Ideally, I would have chosen a garden easier to maintain, but I loved it and the house so much! 1. Maintenance – time or money? How much time and energy have you got to maintain your new garden? If you are lusting after a garden too big for you to manage, can you afford a gardener? You may be able to get someone who is retired and offers basic gardening, and doesn’t charge a lot, (£6.50-£9.50 an hour) but for expert gardeners, with some training and a gardening business, the going rate is £15-£30 an hour. The former will need a bit of supervision if you are a keen gardener who grows a lot of different and less usual plants, if you want to hang on to them. Don’t forget one-off services to get to grips with any major features/plants you may have. I have hedges round 2 sides of my garden, one of which, as the next door garden is down a big slope from mine, is very high on the neighbour’s side, and needs professional help to cut. This costs me £180 a year. In between I used someone who charged £9 an hour and must have paid £1080 a year in total to get the garden maintained – quite an outlay. Lawns will take 2-3 hours per acre to mow, I have heard say; mine takes 1.5 hours for a bit less than a third of an acre, including strimming the edges. This is included in the maintenance time given above. Consider the features in the garden you are looking at, in the light of the above. Fences (if sound) need to be retreated or painted every few years. Hedges are great for wildlife and interest, however they need to be cut at least once a year. Look up the species and find out how often that species needs cutting back. Leylandii are the quickest-growing and greediest with water needs, and should be avoided. Yew grows the slowest. Stone and brick will last well without much attention, though ideally stone should be cleaned, especially if in a shady spot where algae can form and make it slippery. You could hire a machine for this?? Decking needs a yearly clean to stop algae forming, unless it’s artificial decking (though this may need a clean less often). Gravel and the gaps between slabs or stones or bricks will need weeding anywhere you don’t want plants growing through it. Yes, even if there is landscaping material underneath, though that may keep them back a bit! Can you maintain the borders in their current state and if not, do you have the energy and will to change them? There’s a lot more I could write here but this is enough for one sitting. May you find the garden that best suits you! Previous post: Pond Wars – or how I Learnt to Stop Worrying and Love the Pond!